Sanne Cant won her third Telenet UCI Cyclocross World Cup race of the season on Saturday in Zeven, Germany. Sanne Cant (Beobank-Corendon) powered to her second Telenet UCI Cyclocross World Cup victory in a row on Saturday in Zeven, Germany. 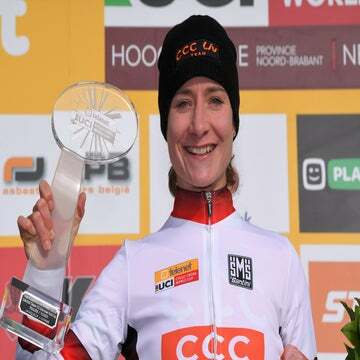 The world champion won the World Cup race in Bogense, Denmark a week earlier and the victory is also her third World Cup triumph of the season as she also won the Waterloo stop on World Cup circuit. Extremely muddy conditions in Zeven made for lots of running with the top elite women consistently producing lap times over 10 minutes. A three-way battle for victory came to the fore late in the race between Cant, Helen Wyman (Kona) and American Katie Compton (KFC Racing/Trek/Panache). Compton was forced to put a foot down at the top of one of the run-ups during the penultimate lap, losing a few seconds to Cant. Wyman was a few seconds behind Compton and was able to bridge back up to the American. Compton’s mistake proved to be decisive, as Cant would solo the final lap and a half to victory. Wyman was able to gap Compton in the final lap, as the American faded. The winner of the day, Cant, was also clearly the strongest rider the entire race. Katerina Nash (Clif Pro Team), who won the opening World Cup round in Iowa City, finished fourth with Sophie de Boer (Parkhotel Valkenburg-Destil) rounding out the top-five. An early morning mist in Zeven, Germany turned the fifth stop of the Telenet UCI Cyclocross World Cup into a muddy affair. Riders were forced to run almost as much they had to ride. Cant, the World Cup leader and only elite women rider to be on the podium at all of the previous rounds entering the race, got off to a great and led the rest of the field out onto the course. The early leaders were Cant, Eva Lechner (Clif Pro Team), and Compton. A crash midway down the field just as the riders turned off the podium forced many to come to a stop. Soon Wyman charged to the front and only Cant could get pace with her. The Briton has had a great run of form lately, since winning the Koppenbergcross at the beginning of the month. There was a strong American contingent in the field in Germany, as many U.S. riders had made the trip to Europe. For a moment, there were three U.S. riders in the top-10 with Compton and Ellen Noble (Aspire Racing) riding in the top-five and Rebecca Fahringer (Stan’s NoTubes) in the chase group battling with Lechner, de Boer, and Nikki Brammeier (Boels-Dolmans). Noble would drop her chain on lap two and thus lose contact with the front of the race. She would ultimately finish in 18th. After two laps, it was clear this was going to be a race of attrition. The lap times for the leaders were over 10 minutes, but three laps still remained. The race was going to be over 50 minutes in length. According to the UCI rulebook elite women’s race are to be a minimum of 40 minutes and not exceed 50 minutes. The winning move occurred on the penultimate lap of the race with Cant taking advantage of a Compton mistake. The muddy course forced many riders to make the decision of whether to ride or run certain sections. Furthermore, the fastest option through a certain section could change each lap. Compton opted to ride a tricky off-camber run-up that would come back to haunt her. Compton’s rear wheel slipped just as she rode over the top of hill causing her to put a foot down. This allowed Cant to get the few seconds she needed and the world champion powered the rest of the way to the finish. Wyman was able to get past Compton, who faded on the final lap, to take second. Nash finished fourth with de Boer finishing fifth. American Kaitie Keough (Cannondale-Cyclocrossworld.com), who began the day sitting second overall in the World Cup standings, took a couple of laps to fully find her rhythm. Once she did so, she charged toward the top-10 and finished in 11th, saving her high-placing in the overall World Cup standings. The Telenet UCI Cyclocross World Cup series continues on December 17th in Namur, Belgium. Namur is a staple on the World Cup circuit and one thing is always guaranteed there — mud.